今天才看到 OxygenOffice Professional 這套 OpenOffice.org 的加強版軟體, 真是後知後覺. 雖然中文網頁有討論的不多, 但是好像早在去年 10 月左右, OpenOffice 補給站就有人發出訊息討論過了. OxygenOffice Professional 說穿了是加強 OpenOffice.org 在編輯上的便利性, 嘗試藉由更容易管理與引用圖片等資源, 加入類 VBA 的 support, 以及提供更多分類後的 templates 來達成 (好像還有額外的 Fonts ?). 我也抓下來試用了一下. 可以看到在編輯 odt 文件時, 能夠把圖片引用選擇開啟在工具列, 然後直接用拖曳的方式拉進去. 不過我覺得圖片選擇工具組能夠開在左右比較好, 因為現在有寬螢幕 LCD 卻沒有長螢幕 LCD (除非把寬螢幕旋轉過來, 但是並非每台 LCD 都可以), 放在左右比較不佔文件編輯空間. 隨便選了一個 maintenance report 相關的 template. 試用歸試用, 我真正覺得有趣的地方在於 OxygenOffice Professional 是否能夠成功, 以及他的成功帶來的意涵. 長久以來 Windows 的使用者習慣於 Microsoft Office 類型的編輯軟體, 即便是後來在 Linux 上的 AbiWord, KOffice, StarOffice 等等其實都是一樣, 此類編輯軟體的 power 掌握在開發團隊手上, 即便有些採用較為開放的 license, 但是缺乏良好的 design 以及 interface, 有心者一樣很難加入開發. 而隨著時間推進, OpenOffice.org 出現了, 仍舊, 跟過去一樣, 是 power 掌握在開發團隊手上的編輯軟體. 但這次有點不同. 不同之處在於同時期出現了一個極為成功 (可能是有史最成功的) 的開發軟體 : Eclipse. 熟悉 Eclipse, 而且使用過如早期 Visual Studio, IBM Builder 系列等等有的沒的 IDEs 的使用者, 應該都能一下子指出 Eclipse 跟這些 IDEs 的最大不同處. 這樣的不同處建立在良好規劃的 software architecture, interface, 以及 open source community 的逐漸壯大上 (當然, 還有 Java 的熱潮). 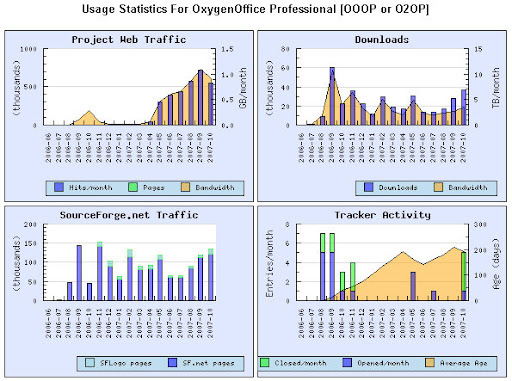 OxygenOffice Professional 給我的感覺就像在 OpenOffice.org 上加了許多 plug-ins, 看那引用圖片管理的工具組, 不覺得跟許多 Eclipse plug-ins 的出現方式很像嗎 ? 或許 OpenOffice.org 想持續壯大, 搶奪 Microsoft Office 的市佔率, 應該考慮以 Eclipse 為學習對象, 變成一個文書編輯軟體的 framework/platform. OOo 本身有絕佳的條件變成文書編輯領域的 Eclipse, 唯一的問題在於目前的 architecture 以及 interface 是否設計的夠好, 如果需要修正, 要花多少 efforts ? This entry was posted on 上午8:05 and is filed under Eclipse , IDE , idea , OpenOffice.org . You can follow any responses to this entry through the RSS 2.0 feed. You can leave a response, or trackback from your own site.